Back in August 2010 I had tested how you can claim missing airline reward miles via the websites of Lufthansa and British Airways, respectively. Just recently I was on two flights with United airlines, for which I still need to claim my reward miles. This made for the perfect opportunity for a follow-up on this topic. Alas, in the almost one-and-a-half years since, almost nothing has changed. British Airways rebranded their miles to “Avios”, so the wording of the link for claiming un-credited miles may just be that little bit less intuitive now. It is still in the same convenient location, though. 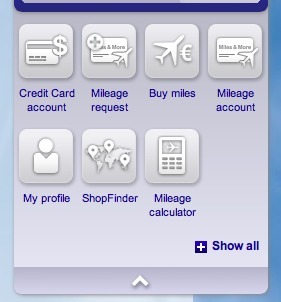 On Lufthansa’s Miles & More website, the previous text-only navigation menu has been replaced with a set of icons that mimic the look-and-feel of the iPhone’s Launchpad. In that menu, the “Request Miles” link/icon combo is a bit easier to find. Obviously, such minor changes alone would not justify writing about this topic again. The serious new problems I experienced with the Miles and More website now are well worth sharing with you, though. 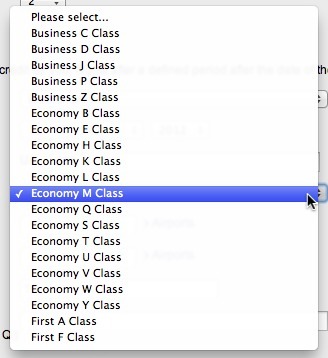 The form requires picking a booking class. That information is not found on the boarding pass, but according to the confirmation email, the classes for my two flights were “G” and “K”, respectively. Since the second flight was listed as a “K” class, I simply selected that class for the first flight as well. Admittedly, this problem is not directly linked to the website’s design. In fact, the error message is displayed prominently, and thanks to the high-contrast highlighting, it’s easy to find the field whose entry needs fixing. Also, in the confirmation email, the flight number is listed without the trailing “Y”. Nevertheless, this is something that the website could take care of automatically: it could silently discard the offending character, or at least offer via a dialog box to fix this, saying something like: “The flight number ‘UA1555Y’ you have entered is invalid. Did you mean ‘UA1555’?”. In this instance, it was easy to correct “my” mistake, but the biggest problem was yet to come. None of the form fields was highlighted, so it was impossible to tell which data item needed to be modified to make the website accept my input. The only thing I could think of was to add the airline code to the flight number. Unfortunately, entering “UA268” instead of “268” did not help, as the site now complained about an invalid flight number. If you think about it, the ticket number should be perfectly sufficient to verify a mileage claim. This is especially true if the ticket was purchased directly from a partner airline’s website. 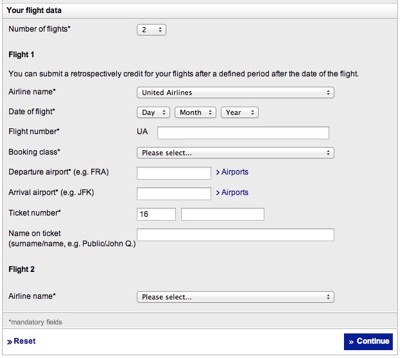 Instead, you have to meticulously and manually copy a whole bunch of data from the boarding passes into the form. And once you did, you may very well be confronted with an error that you, as the user, cannot fix, but that stubbornly prevents you from submitting said data. So I’m stuck now. And used the only option I had. I’ve contacted Lufthansa via their website’s contact form and hope they will tell me what to do next. Who knows: Maybe they will even take the time to explain the problem to me. As soon as I hear back from them, I’ll update this post. Stay tuned!